Do England play better in white or red? As England prepare for their World Cup semi-final against Croatia, fans will be looking for any omen that could point towards a first World Cup final since 1966. You may think it’s all down to the players on the pitch – but some fans believe the colour of the kit could influence the outcome. That’s because England’s “lucky” red shirt is so closely associated with their one and (so far) only World Cup success. But do England have a better record when playing in red? England currently have an impressive 17-game undefeated streak in red. Their last loss in a red shirt was in 2010, in a 4-1 World Cup defeat to Germany. But in the semi-final with Croatia, the Three Lions will be playing in all white – despite being the designated “away” team. According to FIFA, the team assigned as the “home” side gets to wear their regular strip. If the “away” team’s kit colour clashes, the away side wears their reserve kit. But because the Croatians normally play in red and white chequered shirts – which clash with both of England’s strips – they will instead play in blue and black. England do have a history of playing in white at the World Cup semi-final stage: they did so in 1966 and in 1990. So should these fans be worried? 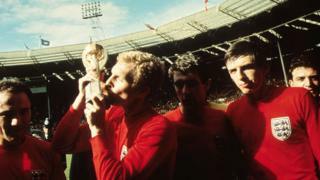 At Reality Check we have analysed the almost 600 games (including friendlies) that England have played between their 1966 World Cup success and their 2018 World Cup quarter final win against Sweden. In that period (1966-2018) England have played in white 449 times. They have won 258 times (57%), drawn 109 (24%) and lost 82 (18%). England also played in red 104 times. They have won 53 of those matches (51%), drawn 31 (30%) and lost 20 (19%). 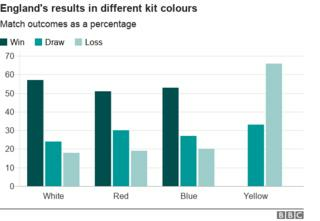 So the likelihood of losing a game is still around one in five regardless of whether England play in white or red – in fact England’s record is slightly better in white. 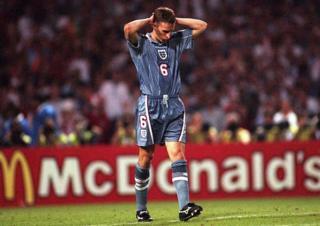 Over the years England have also occasionally played in different iterations of blue, such as 1996 when they wore “indigo-blue” – although most people watching thought it was closer to grey. In blue, the loss record is still 20% – only a couple of percentage points higher than white. In 1973, England played three games in yellow, but there were no Brazil-like performances – they failed to win a single game. But can the colour of a team’s kit really influence performance? In 2008 Durham and Plymouth university researchers published a paper arguing that red kits were associated with long term success in the English professional game. They said that since 1947, English football teams in the top four divisions with a red home kit have been champions more often than would normally be expected (Arsenal, Liverpool, and Manchester United all play in red). One theory is that wearing red could give a team a psychological advantage – that’s because the colour is often associated with aggression and could make a team more confident as well as making opponents feel intimidated. But a more practical reason could be that red, as well as other bright colours, simply improves visibility. This makes it easier to pick out teammates, especially when passing the ball. A 2015 Dutch study for the Journal of Sport Science undertook video experiments to see how easy it was spot players on the pitch in different coloured kits. And the good news – from England’s point of view – is that, according to the research, white provides the best vision against a green football field. So in white or red, the chances of football coming home are roughly the same.